I’ve been roaming around Pinterest for a while now and I’m very keen on discovering its potential, since it is really becoming the next big thing in the social environment we all live in. The team behind this start-up has really developed a product with deep insight into the media consumption habits of today’s internet users, which is why it’s catching on so fast. They are certainly keeping up with the development of the platform, since new details and features are added almost daily. 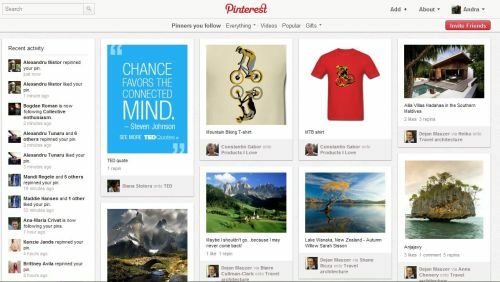 What I like about Pinterest is its simplicity, its design and it’s user experience. Everything is intuitive and clear. No big words, nothing too flashy, no mambo jumbo. The entire philosophy of the website is brilliant, because it is taking user generated content to another level. But its content discovery system looks very familiar. Where have I seen that before? Oh, I remember, on Weheartit! Weheartit is a website I discovered while browsing through Tumblr (another very time consuming platform, but that I never quite stuck to) and when Pinterest was released I could not help but see the similarities. 1. The “heart it” and “pin it” buttons – they do the same thing, which is help you draw content (pictures and videos) to these two websites. 2. “Hearts” and “likes” – these are two equivalent features that help you identify your preferences. 3. “Sets” and “boards” – they do the same thing, which is group your favorite pictures according to a general concept or subject. 4. Sharing on Facebook and Twitter – of course, this feature could not be missing from this entire social context. 5. Upload an “image” or a “pin” – both platform allow you to upload your own content, which is great thing if you’re a photographer or some other kind of visual material creator. 6.Focus on fashion and all things pretty – although this is not exactly a technical similarity, I can see, from direct observation, that the profiles of the two websites are very much alike, both in terms of focus and audience. 7. Discover everyone’s “hearts” or just those from your friends and view your friends’ pins or browse through general categories or popular content – the separation of the streams of content is the same, the difference being that it’s just organized differently. A difference between the two is that I believe Weheartit’s public is younger than Pinterest’s (I suspect a 14-20 years old majority on Weheartit and 18-25 on Pinterest). Weheartit has a feature that I enjoy and hope to see on Pinterest soon: similar images – according to the website’s algorithm, it suggests images that are related to the ones you just hearted or added to a set. Pinterest is also gaining on the plugin front, because it had developed the Pin it button for websites and blogs of all kinds, which will be the next big thing in social media, besides the Like button. They also have a Follow button that you can add to your website and many independent developers have created plugins that can display your latest pins in sidebars. You can check out all the official goodies here. A very nice touch are the blog and the Pinterviews. This brand seems to have a very high “loveability” potential, because it’s making up words which really sound good (which obviously I’m not good at). Their way of communicating is just cute, clean an the to point. And I believe these are the premises for success. 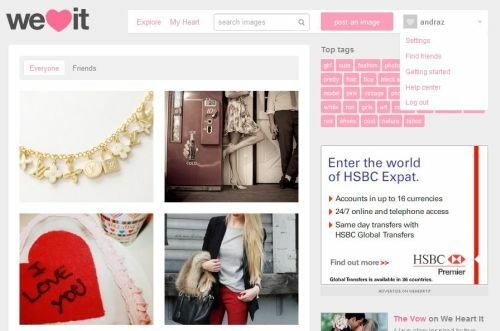 Weheartit never stood a chance, although it might have been a model that the team behind Pinterest was inspired by. affiliate marketing – this is a gold mine for this sector and it may be the moment where it can shine and really catch on, returning real profits. advertisers – creating visually compelling content is a good advertiser’s game and this could help a lot with general branding and personal branding. This also has the advantage of not being intrusive and could very well integrate with the users’ interests and passions. The platform’s appeal is clear and I will continue to stick to it and observe how brands approach this network and what they make of it. Are you on Pinterest? Leave a link with your profile below, because I would love to check it out. I 100% agree with you. I love both sites. Pinterest is more mature and has more elegance. I believe it will grow even more. Thanks for your comment and I hope to see you around! I am having fun incorpoating Pinterest into the social media of our vacation renal business. It brings an unique oppirtunity to display the visual beauty of Key West and all the thingsand aspects of vsiting and enjoying the island. That looks beautiful, Cindy! Congratulations! I hope it’s having the desired effect, because it certainly is a great channel to promote Key West’s beauty. Thank you for this insightful article. I accidentally came upon WHI today and thought I’d possibly do it in addition to Pinterest or instead of it…but I’m glad to see what you had to say about it. I’m actually going to be 60 this month and have found Pinterest to be VERY addictive. My rear end is spreading by the minute, LOL, I really didn’t need another reason to spend hours on my computer. Thanks!! Weheartit is definitely more for the teenage girl than pinterest. Generally from what I have seen, weheartit has younger girlier pictures and less home decor,wedding and marriage pictures. The demographic for weheartit is probably 14-25 and pinterest is 30-50+. What I really love is weheartit’s plugin – it’s so goddamn polished. Simply drag an image to the heart and voila. I haven’t seen that kind of execution anywhere. I wish Pinterest could adapt something like that :(. Yes I see a better technical tool in WeHeartIt. More practical to heart images too when you are doing it in the context of the page. Pinterest has a lot more money and invests it differently, more on the blong side, than on the technical quality. I wish I could transfer all my images on WeHeartIt to pintereset since it is more professional but I knew about WeHeartIt before pinterest. If WeHeartIt was more professional I would keep on using it. l love pinterest. thank u so much for giving review about we heart it. I was thinking to download it but b4 I checked reviews. seems pinterest is much better than we <3 it. as u said it's more good for teenagers even I am teenager, but I don't want idiotic post from teenagers who post emotional, immature , & stupid content which is none of use & will not give any benefits in future & pinterest is just awesome. its inspirational app I can say. its all in one & must say bestest app ever.